Most people, especially women, recognise that uncomfortable feeling when their stomach suddenly swells up like a balloon, often accompanied by stomach pain and flatulence. This may be triggered by, for example, eating the wrong kinds of food, stress or a number of other factors. Stomach bloating is actually a very common condition which affects around 1 in 5 people on a regular basis. For many sufferers, this is just an accepted part of everyday life because they are either too embarrassed to seek help or because they have had no luck in terms of a specific diagnosis of the root cause. Some others, who have suffered for a number of years, may simply start to believe that it is ‘normal’. It is not. Bloating can be very unpleasant, as well as unsightly. Listen to your body – everyone experiences a bit of bloating from time to time, but if you are feeling bloated on a regular basis (and perhaps suffering with excessive wind, abdominal pain, constipation or diarrhoea) your body is trying to tell you something. There is no need to simply accept bloating as an unwanted part of your life. Get to the bottom of what is causing it and then take action! The first step in stopping bloating is identifying what causes it in your specific case – everyone is different. The actual swelling of the belly associated with bloating is most often caused by gas in the bowel. However, when we talk about the cause of bloating, we are talking about what triggers this reaction. a high toxic load (particularly in the digestive tract). Many of these triggers are also connected or inter-dependent. For example, if your gut is inflamed or your bowels are sluggish, it can create the perfect environment for bacterial overgrowth (or dysbiosis). Similarly, food allergies or intolerances can contribute to gut permeability. Poor diet: Considering that the digestive tract is the system through which we access nutrients and eliminate waste and toxins from the foods we eat, it is hardly surprising that diet plays a key role in the health of the digestive system and, in particular, the bowels. For example, a high intake of sugar can place a great deal of stress on the body and increase gut toxicity, by feeding bad bacteria and yeast. This can in turn increase the amount of fermentation in the gut which can lead directly to bloating. In fact, abdominal bloating, constipation, diarrhoea, gas (both burping and flatulence) and IBS are all symptoms of a digestive system and liver overloaded with toxins. Poor digestion: The average person consumes more than 25 tonnes of food over their lifetime! To avoid creating internal toxins which can lead to symptoms like bloating, digestion must be efficient. In real terms, this equates to 1 – 3 bowel movements per day, depending on the amount of food eaten. All too often, people eat too quickly because they are in a rush or feeling stressed – this is a bad start for the complex process of digestion. Digestive enzymes, required for the complete breakdown of food, are released at different stages of the digestive process. If food is not chewed thoroughly, the enzymes do not get a proper chance to act. Similarly, stress inhibits all enzyme secretion. Hydrochloric acid also plays a key role in the digestion of protein in the stomach. Many people with poor diets and/or digestion suffer with indigestion (heartburn) on a regular basis. As such, they start to routinely take antacids and other stomach acid blockers so these people are unlikely to be digesting protein properly and may therefore experience abdominal bloating, reflux and burping. It is also worth noting that, as we age, our levels of hydrochloric acid and digestive enzymes decline. Food allergy / intolerance: If digestion is poor, or there is an imbalance in gut flora, or there are nutritional deficiencies or gut inflammation, what is known as ‘leaky gut syndrome’ can develop. This means that the intestinal lining becomes more permeable than it should be, allowing toxins and partially digested food molecules to enter the bloodstream. This can place the immune system under immense strain and, over time, can contribute to the development of food intolerances and/or allergies that can produce wide-ranging symptoms. These commonly include bloating, abdominal pains, water retention, IBS, weight gain, cravings and fatigue. In the majority of cases (upwards of 95% of cases), food allergies and intolerances develop over time, so that a food that you once tolerated well now makes you unwell. Any foods that you are allergic or intolerant to essentially act like poisons in your body. Continuing to include them in your diet can create inflammation, further weakening your immune system. If you continue to eat these foods, your body will try to dilute them to minimise their harmful effects. This can, in turn, congest the lymphatic system, leaving you feeling puffy and bloated. Imbalance of gut flora: It’s estimated that there are more than 500 different species of bacteria present in the human gut in concentrations of between 100 billion to 1 trillion microbes per gram. This amounts to around 95% of the total number of cells in the human body. These naturally-occurring friendly bacteria in the stomach and intestines can quite easily be disrupted, resulting in an imbalance between the beneficial bacteria on the one hand, and harmful micro-organisms on the other (dysbiosis). Such an imbalance of gut flora makes the body more vulnerable to the overgrowth of yeast (such as candida albicans), fungi, parasites and harmful bacteria. The toxins produced by these micro-organisms, along with poorly digested food, a high-sugar diet and medication (like antibiotics) can all alter the intestinal pH, destroy good bacteria and then lead to bloating. Irritable Bowel Syndrome: IBS involves the colon being held in spasm. The four main symptoms are bloating, stomach pain, excessive wind and altered bowel habits (diarrhoea may alternate with constipation and the condition is often accompanied with the sensation that the bowel is incompletely emptied). Discomfort is usually relieved on passing stool or wind. IBS is often linked to emotional factors (such as stress) rather than allergies/intolerances (although it is thought that cow’s milk and antigens in beef can precipitate the condition), with around one-third of cases being linked to diet. Women are more susceptible than men. Bowel disease: Bloating is one of the symptoms of an inflamed bowel, which can be caused by a wide range of conditions, including Crohn’s disease and ulcerative colitis, as well as severe food sensitivity (as seen with coeliac disease, for example – an autoimmune disorder triggered by gluten intake). Chronic constipation: Constipation can have a number of underlying causes, but if food is only partially digested (for instance because of a lack of digestive enzymes) and that food reaches the colon, it can putrefy and ferment. The problem is compounded if there is a lack of fibre and water in the diet. The longer food sits in the bowel, the longer gas-forming bacteria have to work, leading to bloating. So, if you suspect that any of the above could be contributing factors to your bloating, how can you beat the bloat? Well, a diet packed with natural whole foods (such as raw fruit and vegetables, rich in enzymes), quality dietary fibre, fermented foods (rich in probiotics), foods low in additives, preservatives, salt and sugar, and with plenty of pure water, is a great start! Combine this type of well-balanced diet with regular exercise and you have one of the best ways to keep your digestive system healthy, regular and efficient, and therefore to beat the bloat. supplementing your diet, as required, with high-strength, multi-strain probiotics, digestive enzymes and dietary fibre. 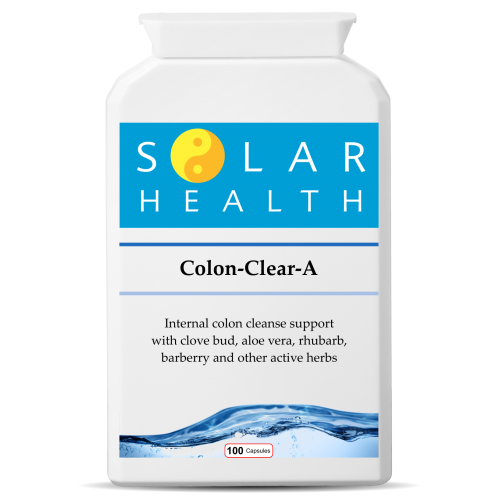 If you suspect that years of poor diet have resulted in a sluggish bowel or ‘hidden’ constipation (where, despite daily bowel motions, waste-matter actually sits in the colon for several days before elimination), a colon cleanse or full body detox may also be of benefit. All the long-established dietary and nutritional therapies used down the ages recognise the benefit of regularly cleansing the system, starting with the colon. This can help to rid your body of accumulated toxins and therefore reduce the likelihood of bloating.